Research is devoted to the analysis of economic diversity of global actors and the process investigation of rethinking social change and social movements in favor of alternative model of global society. The purpose of the research is to analyze alterglobal movements aimed at economic valorization of diversity and elaboration conclusions on the implementation alterglobal model of the world economy. The object of research is the alternative model of world economy development. An evaluation of conflicting relations of the alterglobalization and neo-liberal ideology is carried in terms of market self-regulation. The influence of neoliberal ideology on actors is determined; the deprivation of world general alternatives is defined by the global system promotion of market management and government intervention. The process of rethinking social change and social movements is studied particularly in the matter of calling the existing forms of activity; concepts of changes associated with large movements of industrial society. Participation of alterglobal movement is identified in the fight against offshore relocation, economic inequality and social justice. An analysis of valorization of economic diversity is conducted as one of the defining values of alterglobal movement in the aspects of identity, convergence, relevance and alternativeness. The conclusions on the specification and verification of alterglobalization understanding are formulated. Alterglobalization, ephemeral network, neoliberal model, non-governmental organization, poverty gap, social movement, valorization of diversity..
EMU imbalances correction sparked active discussions on choosing the optimal policy for mitigating risks of divergence and restoring competitiveness. Concentration on balance of payments is within the framework of simultaneously solving the problem of external imbalance, capital outflow, restoring growth, and preventing the opposing vectors of trajectory of the real effective exchange rates. However, overcoming the crisis consequences requires a wider approach to how the imbalances correction contributes to the growth recovery. Theoretically, the rate of post-crisis growth recovery should correspond with the variables that constitute imbalances correction. Based on regression analysis, it is clear that such hypothesis is proved only partially. Growth is more likely to recover if there is a more substantial correction of current account and credit market cleaning-up, whereas the correction on real estate market is not as effective. At the same time, real disposable income correction is likely to negatively influence the growth recovery. Nevertheless, this doesn’t mean that internal devaluation shouldn’t be utilized as an option during macroeconomic adjustment. It should occur with credit market cleaning-up. Fiscal space is crucial here, as it determines the credibility of fiscal policy devoted to mitigation of accumulated household sector debt burden. The reaction to the financial cycle is a fundamentally important element of macroeconomic management in the monetary union in regards to the macroeconomic design of integration zone. EMU, financial imbalances, growth recovery, credit market, current account, real estate market, real income, internal devaluation. The analysis of adaptation circular economy according to the principles of 3R (Reduce, Reuse and Recycle) is made and the fourth principle is proposed - global corporate social responsibility (Responsibility), as obligatory in the formation of global circular value added chains. Successful practical examples (startups) of the basic ideas of circular economy implementation are proposed. The circular economy should be considered at the micro, mesa and macro levels, covering production, consumption and proper waste management. Indicators of micro, mesa and macro are evaluated for implementation circular economy. Circular economy as a vector for sustainable development requires a needed shift from linear to circular way of thinking. Circular economy seeks to separate economic growth from using of the natural resources and ecosystems through more effective use of these resources. According to the definition it is a driving force for innovation in the resource and component reuse product that is equivalent to the new business models, particularly in the service sector. Outlined prerequisites that make the circular economy like necessary business model, including the resources and pricing them, the increasing number of middle class, «big data», changing legislation and management, the transition from «agreement» to «relations». It is alleged that the transition to a circular economy means changes in thought and action, which requires a systematic approach and affects how the business model, management, law, logistics, housing, agriculture and other will be organized and structured. Circular economy is a system in which resource flows effectively managed and processed, executed, fully based on renewable energy sources and any action without causing adverse effects on human life and ecosystems within the formation and operation of the global circular value added chain. Circular economy, sustainable development of the country, the principles of 3R, the system of micro, mesa, macro indicators, ecosystems, natural resources, waste management, global circular value added chains, global supply chains of recycled materials, mega level, global corporate social responsibility. The dynamics of external public and publicly guaranteed external debt of Ukraine, the budget deficit and spending and savings in Ukraine in UAN and US-Dollar since 1996 to the present date were analyzed and their trends were built. An emphasize was laid on the following periods: 1996-2006 – a period of sustained economic development (pre-crisis), characterized by slow growth of debt; 2007-2011 – a period of rapid growth in debt (crisis); 2012-2014 – a period of sustained growth in debt (post-crisis); since 2015 until now - a period of a new economic crisis. The predictive values of the debt were calculated for 2017-2021. The method of harmonic scales was applied, based on the principle of aging information, and according to a point projected values of public and publicly guaranteed debt. Their intervals were calculated. 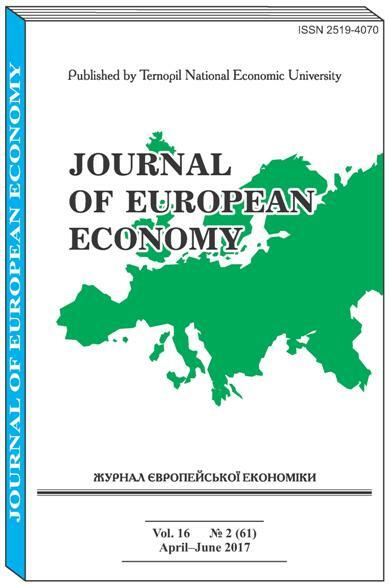 The econometric models dependence of the total external public debt of the budget deficit in Ukraine and vice versa was calculated. It was established that the increasing of the budget deficit by 1% of the GDP leads to an increasing total external debt to 41.856 billion UAH or 3.8762 billion USD. It also leads to an increasing debt by 1 billion USD and to an increasing deficit in the budget to 0.2507% of the GDP. The econometric models depending on costs and savings from debt in UAH and US-Dollar were constructed. It was found that the growth of the total external debt of the state by 1 billion UAH was accompanied by rising costs and savings by 4.637 UAH. The distributed lag model depending the costs and savings from debt in UAH was constructed and equivalent with a delay in one year, according to the increasing total external debt by 1 billion UAH is accompanied by increasing costs and savings next year by 4.2848 billion UAH. The distributed lag model depending the costs and savings on debt in US-Dollar without displacement was constructed. It is founded that the increasing in total external public debt by 1 billion USD increases the amount of costs and savings on 3.6858 billion USD. Models that examine these figures in UAH and US-Dollars show the good consistency of increasing coefficients. The model with instrumental variables was calculated, which shows that the costs and savings are incremental in nature. It was established that the increasing in spending and savings in the current year by 1 billion UAH leads to increasing costs and savings of 1.06771 billion UAH next year. It is shown that the growth of debt by 1 billion UAH leads to increasing costs and savings to 0.0243 billion UAH. Gross external debt, public and publicly guaranteed external debt of Ukraine, costs and savings, budget deficit, trend, time lag, distributed lag model, economic modeling, the method of the instrumental variable, the method of the prediction with harmonic scales. The current situation in the gas market in Ukraine is quite complicated. Problems of adapting the domestic market to European standards cause a number of inconveniences. The biggest problem is the adaptation of the Ukrainian legislation. Approaches to the existing tariff are outdated. Until recently, Ukraine has used a system of "cost-plus". There is a need to move to a tariff known world system "input-output". Is necessary for national regulatory authorities shall adopt measures to ensure that the compensation tariffs were discriminatory and reflect costs. The article briefly describes the main ideas, thoughts and problems associated with the transition to this system. They are the major positions of the current laws of Ukraine and tariff systems and proposals to change current laws, the regulatory formula for calculating the tariffs and the main positions that provides for the formation of tariffs for distribution of natural gas based on years of incentive regulation. Also the result of a pilot project promoting the use of European principles of tariff setting methodology using incentive regulation of gas distribution companies are showed. Tariffs, cost-plus system, input-output system, incentive regulation. The study considers how the phenomenon of state entrepreneurship has been examined in theoretical works by world-famous researchers. It has been brought to light that a comparison of the performance of state-owned enterprises is rather difficult due to divergent views on their socio-economic and institutional framework in different countries. The characteristics of privatization processes that have taken place since the 1990s as well as their current trends are identified. The contribution of an entrepreneurial state in financing and stimulating innovations is analyzed. Bearing in mind the ever-growing role of state entrepreneurship in building business processes, it is noted that the current stage of the development of state entrepreneurship needs significant changes in the state system of economic governance. Taking into account shortcomings over the analyzed period, suggestions have been put forward on how to improve the effectiveness of state entrepreneurship seen as a tool of public administration. State entrepreneurship, public sector, governance model of state property, state capitalism, privatization, innovation activity of the state, social utility. Low investment and other mistakes made in the process of transport development has led to the situation where even the infrastructure of the most developed transport branches does not correspond to European standards. Underdevelopment of transport infrastructure in Poland has become one of the main barriers to growth and modernization of the country. Well-developed transport infrastructure is an important determinant of socio-economic development. Over 25 years after the start of the economic transformation in Poland, the condition of transport infrastructure in this country remains unsatisfactory. However, since the accession to the European Union, the development of transport infrastructure in Poland has improved significantly. Funds from the EU have contributed significantly to this progress. The current financial perspective may be the last chance for Poland to get EU funding for transport infrastructure development in such a large scale. Therefore, it is particularly important that the allocated funds are fully absorbed. For this to happen, project beneficiaries should be able to obtain funds for their own contributions. The increase in bond yields related to rating downgrade, weakening banks or shifting funds from investment to consumption may weaken Poland’s ability to take advantage of opportunities arising from EU funds. Investment, transport, infrastructure, bonds, finance, reform, regional, risks, budget. Grouping of regions of Ukraine is conducted by value integral indexes of economic activity of their industry. In accordance with certain gradation, for most areas (20 in 2015 against 23th in 2014) characteristic was a subzero value of economic activity, caused by the negative values of financial result from ordinary activity to taxation. Drawn conclusion, that one of reasons of unprofitableness of domestic industry there is an excessive volume of other (unconnected with basic activity) charges. For more detailed study of this situation necessary is working out in detail of these charges in the financial reporting of enterprises. For the increase of economic activity of industry of regions, creation of educational-scientifically-productive centers of branch and regional aspiration offers. The aim of functioning of such centers is an increase of level of qualification of workers and innovative constituent of technological development of industries and regional economies in accordance with the necessities of market that will assist the increase of volume of hi-tech products and in a result - positive dynamics of economic potential (assets) and financial results of industry of regions. 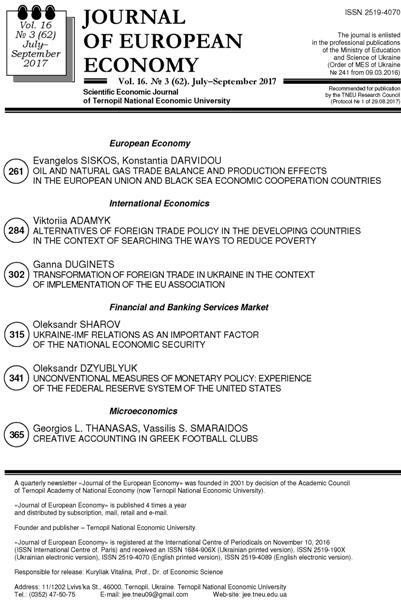 Integral estimation, economic activity, industry of regions of Ukraine, growth of financial result rate to taxation. Identifying the wage gap between men and women. The case of Greece. Gender wage gap is an European and International socioeconomic phenomenon with a negative contribution to the efforts of social cohesion, integrity and creation of a solidarity economy. In national level, efforts for the identification and elimination of the gender pay gap have already started since 1970. Although, the phenomenon of the pay gap was been moderated, it still remains at levels above the European average. The analysis and confrontation of the multifactorial phenomenon requires a holistic approach. Women can actively contribute to employment and economic and social development through the improvement and enhancement of their skills and their general qualifications. However, their skills are often underestimated in respect to their payment and their hierarchy in the labour market. This paper studies the case of Greece by estimating the factors that generate the gender wage gap and the glass ceiling phenomenon through the analysis of micro data from 2010 Earnings Survey provided by the Hellenic Statistical Authority (ELSTAT). We estimate pooled quantile regressions as well as quantile regressions, and we carry out a decomposition analysis by applying the Oaxaca-Blinder decomposition technique. The results reveal that the wage gap is mainly formed due to the discrimination of gender (men and women with the same characteristics receive different wages - female wages are significantly lower). Moreover, we approach the glass ceiling phenomenon which is mainly caused due to personal characteristics of individuals. Two scientific methodical approaches are singled out to research military economics: as a constituent part of military business which provides for the defence (military) potential of the state, and as a science which studies regularities of economic provision for military business in the state (defence, building , maintenance of armed forces, etc.). It is to be noted out that the competition at the world market of weapons takes place mainly between the USA, Russia, Germany, China and France, the share of which constitutes 74% of military production export. Within the framework of researching military economics are singled out branches manufacturing planes-fighters and production for cosmic sphere. Advantages were shown of planes-fighters of the fifth generation of the USA F-22, F-22 and F-35 Lightning 11 (project is financed by the USA together with Italy, the Netherlands, Australia, Canada, Turkey, Norway and Denmark) over Russian-Indian project T-50 and Chinese Chengdu J-20 and J-31. The evaluation is made that leading countries are able by 2030 to build planes-fighters of the sixth generation. The opinion is expressed that the geopolitical position of Ukraine and, in particular, the aggression and annexation of Crimea by Russia make a priority of restoring the fighting capability of the military aviation of Ukraine and of increasing the level of its combat power. It is stressed that for this purpose it is necessary to systematically and rather rapidly substitute the Soviet-Russian aviation technology for American one. The possible ways for equipping armed forces of Ukraine with new planes-fighters are determined the following: their development and manufacture in cooperation with other countries or the organization of licensed manufacturing, import, rent or lease of present-day fighting planes of foreign make. Taking into account that Ukraine enters the club of cosmic states and through the lacking finances it at present is unable to compete on equal terms in manufacturing aerocosmic technology it is suggested to re-orient the economic policy of the country at integrating into European cosmic branch. It is pointed out that for this purpose it is necessary to load the capacities of the State enterprise “Production association “Southern machine building plant named after O.M.Makarov” and designing bureau “Pivdenne”. It is recommended to develop the cooperation of Ukraine in manufacturing rocket-carriers “Zenith” for projects “Sea start” and “Land start” and the cooperation with American companies (Orbital ATK – RH “Antares”) and European (AVIO, Italy – PH “Vega”); to implement ambitious Ukrainian-Brazilian project “Cyclone-4”. It is made more precise that Ukraine may propose to partners the cooperation in continuing the development of multifunctional rocket operative- tactical complex “Sapsan”. Military production, aviation building, cosmic branch, development, world market. The concept of organization as an organistical system facing the challenges of the creative economy is considered. It is grounded that the ideal creative organization with a high level of information will represent a certain symbiosis between organic and anarchic culture in the future. It is identified that with the emergence of virtual organizations, traditional elements of the organizational culture lose their value, while the informational technologies create opportunities for communication and collaboration, regardless of distance and borders. Thus, the basis for the virtual organizations creates their adaptability and transferability. Key requirements regarding the creative industry management organization are singled out as following: proactivity, strategic perspective, innovation, initiation of risk, modeling, experimentation and creativity, support of the independent business units’ coordination. The model of organizations’ types, which should reflect their organistical nature, strategic perspective and attitude to risk is presented. The main barriers that limit the ability of organizations to creativity - the lack of the innovative organizational culture as well as the lack of professional risk managers and analysts are outlined. However, these features have not yet organically become peculiar by creative organizations, requiring the development of the appropriate business models culture. Creative economy, organistical system, organizational culture, creative organization, virtual organization, complexity of organization, integrity of organization, organic culture. Credit unions have been functioning on the financial market of Ukraine for more than twenty years, and necessity of their existence is still questionable. Imperfect system which controls credit unions in our country often leads to distorted activity. Investigating the uniqueness of the world credit unions and basic principles of their activity stipulated the necessity of a completely new approach to the evaluation of credit unions positions in the world market of financial services. Due to the analysis of penetration it is educed that credit unions embrace a substantial financial market share on different world continents. A cluster analysis revealed that credit unions with the similar functions belong to the same cluster. After investigation of management monitoring systems of credit unions in different countries it has been established that these systems are rather "ex"/ "post" indicators of the present credit unions problems. Relations between regulators and credit unions are of different types. “Three Bucket Approach” methodology for credit unions and theoretical aspects of the methodology, which involves reserve formation on loans and its application have been considered. financial system, credit unions, cluster analysis, multidimensional adaptive splines, penetrations, control system, model, "Three Bucket Approach" methodology, loans, backlogs. The article analyses main stages in the internationalization of innovation activity undertaken by transnational companies and offers a generalization of approaches to its various forms. The analysis of the process of R&D internationalization was carried out based on the roles of subsidiaries in the general structure (network) of TNCs. The study of the evolution of innovation processes was performed in the context of behavioral types and roles of subsidiaries within the TNC networks and the host country environments. The analysis was focused on the main types of local and global linkages in the context of scientific and technical cooperation, with particular attention paid to TNC subsidiaries with a global role in research and development. The findings exposed the impact of TNCs’ internationalization of innovations upon host countries, revealed major tendencies in global knowledge spillovers, and corroborated the significance of linkages between structural units of TNCs and their partners in the host countries. absorptive capacity, global scientific linkages, global technological linkages, innovation, innovation potential, innovation system, internationalization, local scientific linkages, local technological linkages. The basic indicators of tourism development in Ukraine are analyzed and identified its problems. Established, that the tourism industry in Ukraine is rapidly developing, below the global average, is due to annexation of Crimea and the Russian military aggression in the east, the low efficiency of the public administration and low level of government spending in tourism. It is shown the main directions of cooperation of Member States under the Association Agreement between Ukraine and the EU in Part "Tourism", concerning for the exchange of information, sustainable tourism development, promotion and development of tourism products and markets, training specialists and others. Defined priorities of the Action Plan for the implementation of the Association Agreement in the field of tourism in the 2014-2017: amending the Law of Ukraine "On Tourism", project the Strategy for Development of Tourism and Resorts 2025, harmonization of national standards with the International Organization for Standardization. A monitoring of the implementation of measures for the integration of Ukraine into the EU tourism sphere for 2014 - early 2017 in the following directions are conducted: legislation, strategy of the development of tourism and resorts, licensing, standardization and certification, visa liberalization, cooperation in tourism. Emphasized, that one of the main challenges of European integration of countries in the tourism sector should develop regulations to attract foreign investment, improving government funding, harmonization of qualification requirements and standards of higher education for training in tourism. Certification, cooperation in tourism, European integration of Ukraine in the tourisms sphere, financing of tourism, international tourist arrivals, legislation in tourism, licensing, standardization, strategy for tourism and resorts development in Ukraine, visa liberalization. The problem was raised of the public entrepreneurship role as a factor affecting the development of the regions. The urgency of the research is due to the fact that the issue of state participation in the national and regional economies remains controversial in economic science. This is especially important for the countries with emerging markets. For Ukraine the importance of the research is peculiar because another wave of privatization is expected. 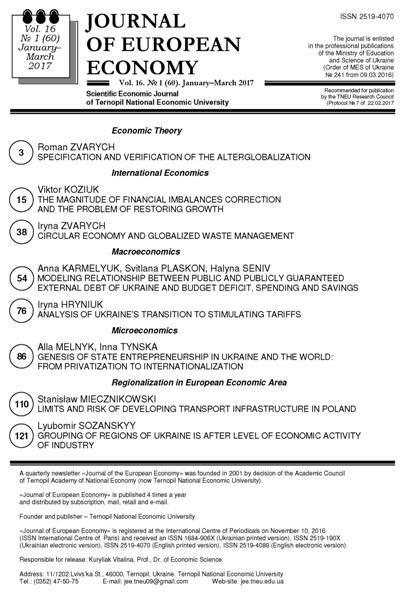 The author offered her method of analysis that complements the existing approaches to evaluating the effectiveness of the institutional phenomenon, in particular, the use of the methods for comparative analysis of the concentration of state business in the world countries and Ukraine, and assessment of state entrepreneurship functional load in specific regions. The empirical analysis is made, and the functions of public entrepreneurship formed for ensuring the regional development. The conclusion is made on the appearance of economic, social, environmental and political risks when making unreasonable decisions about the prospects for public entrepreneurship, and suggestions are substantiated for the selection of the criterial base for institutional changes in entrepreneurship development all through the regions. entrepreneurship, public entrepreneurship, efficiency criteria of public entrepreneurship, functions of state entrepreneurship to ensure regional development. JEL: L71, L95, Q35, Q43, F14, J23. Most European Union and Black Sea Economic Cooperation countries are net importers of petroleum and natural gas. Searching for new deposits and construction of new pipelines can improve energy security in the region. The problem is topical for Greece which has a developed refinery industry and needs to improve its trade balance to repay the accumulated external and public debt. Several new pipeline initiatives through Greece can support relations between the EU and BSEC countries. The paper provides previous research review about energy dependency and the effects of trade, production and transportation of hydrocarbons. Next we provide analysis of the effect of the trade on balance of payments in both the EU and BSEC countries. Import dependency of GDP on oil and natural gas is especially large in Malta, Georgia, Ukraine, Serbia and Latvia. On the other hand Russia and Azerbaijan are large net exporters of hydrocarbons. Then we analyse the impact of mining on labour market and refinery industry development. On average larger value added in mining leads to larger employment at least for males and middle age group of people. But the effect largely varies across countries and time periods. Together with construction of new pipelines growth of extraction can result in dozens of thousands of new jobs in Greece. There is a close link between value added in mining and compensation of employees in that industry. We have found evidence that the clustering effect between mining and manufacture of refined petroleum products and coke exists only in some EU countries. Oil and natural gas industry, trade balance, mining, energy supply, employment, European Union, Black Sea Economic Cooperation.